Following on from my last post…here’s a little video of my trip to sea mussel collecting, plus what is one of my favourite mussel recipes. Now that it is peak mussel season this dish would make the perfect Christmas dinner starter. James (of Menai Mussels) sent me off home after our day out clutching a bag of freshly caught mussels, which I promptly cooked with finely shredded leeks, smoked bacon and a good helping of medium dry cider. Voila! they were transformed into a gorgeously creamy and beautifully warming supper served with french bread (home-made if possible) and a couple of finger bowls. 2k Menai mussels in their shells, very well washed, debearded and scrubbed. I like to rinse at least four times under cold running water. Heat the olive oil and butter in a large pan. Add the onion and leek and cook gently over a low heat for about 10 mins. Turn the heat up to medium and add the bacon, garlic, thyme and cook briskly, stirring so that the onion and leek don’t burn. The bacon should just be turning golden when it is time to add the mussels. Tip the mussels into the pot and pop on the lid. Give the pan a good shake to combine with the leek and oil. Remove the lid and pour in the cider, giving the pan a shake again. Turn the heat up a little more, keep the lid tight on and allow to cook for about 5 minutes or until all the mussels have opened up in the pan. Once cooked add the cream, parsley and some salt and pepper. When you have eaten all mussels and dumped the shells to one side you will be left with all the luscious creamy juices, mop up with plenty of bread and a soup spoon. 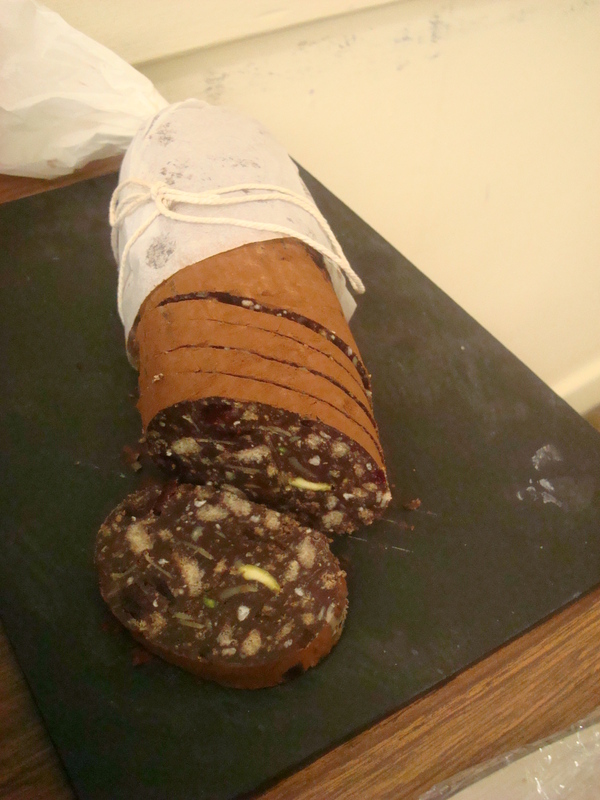 I first came across chocolate salami at my Grandad’s 90th birthday party of all places! For once I wasn’t doing the catering, so got to sample the lovely grub created by the son of a friend and one of the things he made was this. I think I polished most of it off myself! Despite the name it contains no meat and needs minimal cooking. It is simple, Christmassy and makes an unusual accompaniment to coffee at the end of a meal. Crush the Biscuits into small pieces, but not crumbs. Mix with the almonds, cranberries and pistachios and sprinkle half of the port over the mixture, set aside. Melt chocolate and butter in a metal bowl, placed over a pot of simmering water. Once melted add the icing sugar, salt, egg yolks, the rest of the port, vanilla and condensed milk, mix well and continue to cook over the bain-marie for a further 4 minutes to cook the eggs, stirring regularly. Remove from the heat and stir in the biscuit mixture mixing well. Leave the mixture to cool for about 10 – 15 minutes, this will make it easier to shape as it will thicken and set. Shape it into a salami shape roll between a double layer of cling film. Put into the fridge to set overnight. Remove the cling film and roll the salami in cocoa powder. Wrap ready for serving in a sheet of greaseproof paper and tie the ends with string, just as a salami would be wrapped. Serve with good strong coffee by cutting on the diagonal. Not all recipes use nuts and fruit, but i really liked this one and it gave it that Christmassy feel with the addition of cranberries.